Elisa is the main character in the story. She is a princess to the country of Oravalle and the bearer of a godstone. If you are like me I had no clue what a godstone was, it is described as a jewel implanted in Elisa’a belly button. It signifies that she is marked by god as one who will do a Service. When I was reading this all I pictured wer the trolls that had the jewels as a bellybutton lol. But anyways ….. Elisa describes herself as the overweight younger sister who has never done anything worthy of bearing the godstone. At the start of the book we learn that Elisa’s father has arranged for her to marry a King of another country. Elisa is only 16 years old and she has never met this man before, so she is confused at what her fathers intentions may be. She starts out as a very nervous unconfident character. Always worried about what others think of her, mostly worried about her weight. But as the story goes on Elisa becomes a much stronger character. As the bearer of a godstone she has a lot resting on her shoulders and she does not want to disappoint. She worries less about how others see her and focuses on what she has to do to save her people. It was nice to see a female character that was able to stand on her own and not depend on a man. I think that the author did a nice job of really bringing you into Elisa’s world and thoughts. The plot was very interesting and I never got bored with the story. 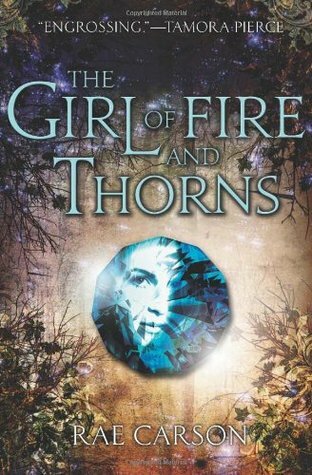 The Girl of Fire and Thorns is the first of a planned trilogy. I look forward to continuing Elisa’s story, but this book ends in a nice place and had enough closure to stand alone as a single book. Thanks for your review! Today’s guest reviewer was Crystal, who regularly blogs reviews and more at What R U Reading? Once a century, one person is chosen for greatness.Elisa is the chosen one.But she is also the younger of two princesses, the one who has never done anything remarkable. She can’t see how she ever will.Now, on her sixteenth birthday, she has become the secret wife of a handsome and worldly king—a king whose country is in turmoil. A king who needs the chosen one, not a failure of a princess.